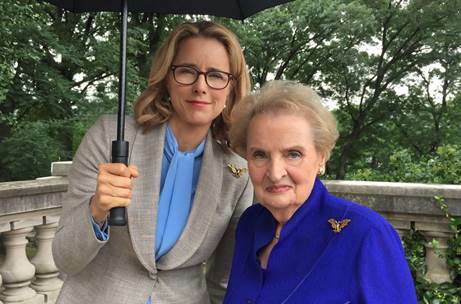 'Madam Secretary' meets Madam Secretary. ‘Madam Secretary’ and the original Madam Secretary will meet this Fall, announced CBS Entertainment on Tuesday afternoon. According to a press release from the network, the second season of Madam Secretary — premiering October 4 — will feature an episode in which former Secretary of State Madeleine Albright will guest star as herself. Albright advises Secretary of State Elizabeth McCord (Téa Leoni) on how to navigate a sticky situation with National Security Advisor Craig Sterling (guest star Julian Acosta), that is threatening to fracture her relationship with President Conrad Dalton (Keith Carradine). Albright, nominated by President Bill Clinton and unanimously confirmed by the Senate in 1996, became the first woman in United States history to serve as Secretary of State — paving the way for future female Secretaries of State (Condoleezza Rice and Hillary Clinton).